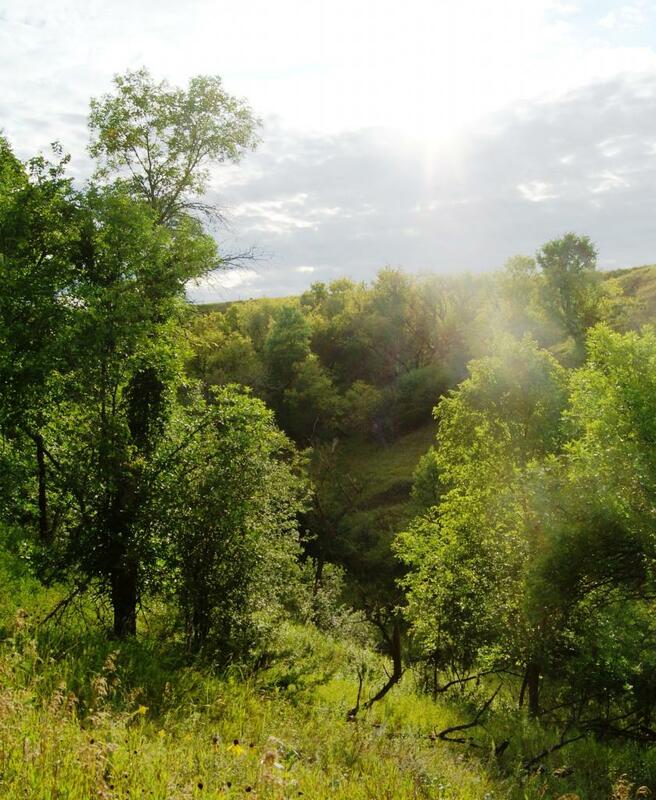 Taking its name from a 1860s military fort, Fort Ransom State Park is located in the midst of the scenic and heavily wooded Sheyenne River Valley. The river provides abundant opportunities for canoeing, fishing and bird watching, while within the park can be found a short segment of the North Country National Scenic Trail. During the summer, horseback riding and camping are favorite activities, while cross-country skiing is a popular winter sport. A farmstead within the park is the setting for the annual Sodbuster Days celebration with demonstrations and exhibits of homesteading life. Looking to enjoy a historic homestead with modern amenities, the Bjone house is the perfect getaway for you. 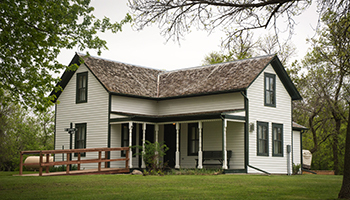 Situated along the Sheyenne River, visitors can enjoy staying in this fully restored house during any season. This early pioneer homestead house, constructed in 1879, has 3 bedrooms and 1 bathroom. The home has a full kitchen and deck out back overlooking the Sheyenne River. On the weekends (Friday & Saturday) and holidays, a two-night minimum stay is required for the Bjone House. The Pederson and Redeske Yurt are twin yurts that sit adjacent to one another at Fort Ransom State Park. Centered around the 14-mile trail system at Fort Ransom, visitors are just steps from two major trailheads. 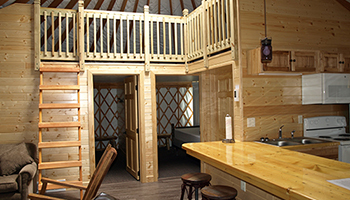 These full-service yurts are available year-round and include a full kitchen and bathroom. These yurts sleep six with two bedrooms, loft space, and a pullout couch. On the weekends (Friday & Saturday) and holidays, a two-night minimum stay is required for the Pederson and Redeske Yurts. This homey cabin, built for two, is open seasonally. The cabin is a single room with a bed, table, refrigerator, and recliner. - Guests are expected to do general cleaning before vacating, including sweeping, wiping down surfaces and collecting and bagging trash. - On the weekends (Friday & Saturday) and holidays, a two-night minimum stay is required for all full-service cabins and yurts. - Check-in is after 4 pm, check-out is at noon. - Smoking is not allowed in any cabins, yurts or tipis. - Game or fish cleaning in or around cabins or yurts is not allowed, please contact park staff for other arrangements. - Pets are not allowed in cabins or yurts. - Bedding and towels are not provided. - Campsites and seasonal lodging can be booked 95 days in advance from the date you wish to stay. - Reservations can be made online, by calling the call center (800-807-4723) or calling the park directly. - Check-in is at 4:00 pm on the first day of the reservation and checkout is at 3:00 pm on the last day of the reservation. - Pets are welcome but must stay on a leash. Most parks have off-leash areas or dog parks for your four-legged friends. 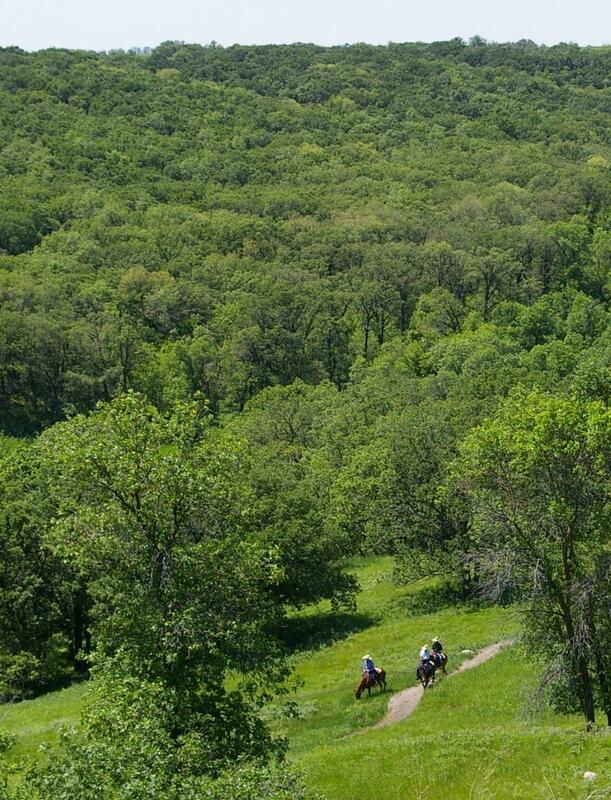 Fort Ransom State Park is one of North Dakotas designated horse parks. This park is set up with 68 corrals and additional amenities to accommodate equestrian users. In addition to a park entrance fee, equestrian riders need to purchase a horse pass. Daily and annual options are available and are required per horse. Permits are available for purchase in the park or online here. The money generated from these fees goes towards maintaining horse trails. Users are responsible for the upkeep of corrals and other impact areas. Please clean up hay and manure daily and before you leave, both in the park corrals and all use areas. Ride only on trails designated for horse use. Ask park staff for information about park areas that are closed to horseback riding such as, campgrounds, playgrounds, or picnic areas. Tie horses to corral posts or horse trailers, not to trees. The use of hobbles is prohibited. Leave all gates as you found them. All North Dakota State Park and Recreation Area maps are available free on Avenza maps, download the free App here. Hay is available for purchase at the park. Bringing horses into North Dakota: Information on health certificates and tests can be found on the North Dakota Department of Agriculture's website, https://www.nd.gov/ndda/, under Animal Import Permits. Fort Ransom State Park now has an “Off Leash” area located at the southern tip of the park. There is river access and a walking trail located in this area of the park. The Sodbuster Building includes an indoor kitchen and seating with tables for 64, utensils are not included. The building is available mid-May to October 1st. 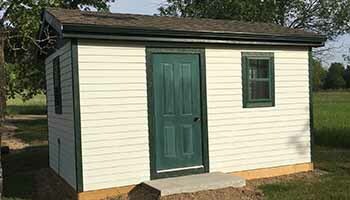 To book the Sodbuster Building call the park at (701) 973-4331. The Visitor Center Meeting Room seats up to 16 people. Rental includes audiovisual equipment with 65” TV monitor and WiFi access. The meeting room is available year round and can be booked by calling the park at (701) 973-4331. Fort Ransom has two small group shelters with a capacity of 40 to 48 and 5 to 6 tables each (no electricity). To book a picnic shelter call the park at (701) 973-4331. If renting equipment for a larger group, contact the park ahead of time to ensure equipment is available. Canoe rentals are available for $8/hour or $50/day. Paddles and life vests are included in rental fee. Please call the park to check availability. Cross-country ski rentals are available for $15/day. 30 pairs of cross-country skis are available for rent. Kayak rentals are available for $8/hour or $50/day. Paddles and life vests are included in rental fee. Please call the park to check availability. Fort Ransom has a canoe/kayak launch next to the visitor center behind the Bjone house. The run is about 5.2 miles downstream; park staff pick-up riders at the boat ramp located at the Fort Ransom Sportsman Club Park. The park charges a transportation fee of $20 with an additional $15 if another vehicle is required for transportation. Fort Ransom State Park’s non-motorized trail system covers over 20 miles in a series of loops, trails and connecting segment trails most which are multi-use and are open for hiking, horseback riding, biking, cross-country skiing and snowshoeing. The majority of the trail system surface is either grass, dirt or hard-packed single-track, with manageable grades with only a few steeper sections. When completed this trail will stretch 4,600 miles from upstate New York to Lake Sakakawea State Park, where it joins the Lewis and Clark National Historic Trail. The 2.2-mile trail segment provides an excellent vantage point for viewing the park's native plants and animals as it stretches from the south to the northeast boundary of the park, along the Sheyenne River. A 2.84-mile multi-use, non-motorized trail. The trail stretches from the Redetzke Ridge Trailhead just east of the Group Picnic Area picnic shelter to the Sunne Farm Trailhead, where it links with the North County National Scenic Trail. The trail with gentle inclines and descents winds in a north-south direction transversing through and around oak woodlands and mixed-grass prairie providing excellent opportunities to view both prairie and woodlands bird species such as clay-colored and vesper sparrows, Swainson’s and red-tailed hawks, Cooper’s hawk, black-capped chickadee, white-breasted nuthatches and bobolinks. This trail begins at the trailhead just southwest of the West Side Modern Campground. The trail gently climbs northward through oak woodlands and mixed-grass prairie eventually intersecting the Ridgeline Nature Trail. A .39-mile gently meandering trail that connects Pederson Hills Trail and Ridgeline Trail providing a shortcut to the Group Picnic Area. The trail begins its travels north alongside oak woodlands, paralleling Bjorn Creek, an intermittent stream, climbing gradually to the North plateau. The trail winds back south to intersect the Snowmobile Trail ending at the Scenic Overlook parking lot. Portions of this trail transverse some very diverse lowland woodlands and adjacent to some rather steep native prairie slopes dominated by big bluestem grasses. The outbound segment travels through a dense woodland canopy dominated by bur oaks and ironwood. Sections of the trail follow the west fork of the Bjorn Creek drainage. The return segment follows the south park boundary fence line. This trail skirts along the large oak woodland. The trail serves as a fire break for controlled burns, reducing the risk of fire from sweeping up the slope into the woodlands. A .94-mile interpretive trail which takes you through a lowland woodland community dominated by green ash and American elm; twists and turns through oak woodlands; and meanders through meadows. There are several wooden walk bridges that cross the Bjorn Creek. The trail contains several numbered posts and a corresponding trail guide describing geology, plant and wildlife in the area. Trail guides are available at the trailhead and Visitor Center. Keep a watchful eye for the long tailed, brown and gray, secretive black-billed cuckoo which is more often heard than seen. Listen for its “cu-cu-cu-cu-cu-cu-cu-cu”. The Eastern wood pewee is another woodland bird that would be overlooked if not for its persistent “pee-ah-wee” song. A .77-mile interpretive trail that branches off the Little Twig Trail and ends just west of the Group Picnic Shelter. It winds its way under a canopy of bur oak, green ash, quaking aspen and ironwood. Portions of the trail take you through mixed grass prairie. The trail contains several numbered posts and a corresponding trail guide describing trees and shrubs of the area. Trail guides are available at the trailhead and Visitor Center. This trail is a good place to observe Cooper’s hawks, wild turkeys, scarlet tanagers and indigo buntings. There is one steep climb on this trail. A .78 mile multi-use trail that starts at the Scenic Overlook parking lot and goes to the Sunne Farm. The short trail crosses an old field and curves along native prairie slopes providing a pleasant overlook of the Sheyenne River Valley. On the prairie slopes you may find little bluestem, big bluestem, green needlegrass, porcupine grass and side-oats grama. Some of the more common native flowers include prairie coneflower and purple coneflower. A .23-mile trail connecting Ridgeline Nature and Meadow Run Trails. This trail is an excellent choice for those hikers and bikers wishing for a shorter, but diverse trail loop adventure. Access to this trail is via the Ridgeline Nature Trail. Access to this .33-mile trail is via the Ridgeline Nature Trail and eventually connects back to the Little Twig Trail. The majority of the trail runs through open grassland bordered by oak woodlands and stands of aspen. The open meadows the trail passes through, provide excellent nesting and rearing habitat for white-tailed deer, rabbits, and turkeys. This .41 mile trails runs south of the campground and around the amphitheater. Horseback riding is prohibited on this trail. This trail follows the parks northwest boundary and meanders around Willow Slough. This trail explores the heavily wooded area with numerous oak and ash trees. As the name states, this area is a favorite hideout for deer. 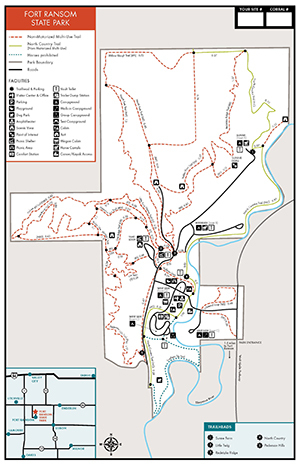 A PDF Map of the trails is available here. Paper park maps are also available at the park. Join the staff at Fort Ransom State Park for a guided hike on National Trails Day. The guided hike will begin at 10:00 am on June 1st at the visitor center. Campers bring candy for Trick-or-Treaters and decorate your campsite! Make sure kids bring a costume so they can dress up and go Trick-or-Treating Saturday night around the campgrounds. Come for all the exciting entertainment at Fort Ransom State Park's 5th Halloween in June! Join Fort Ransom State Park and Beaver Lake State Park for the 2nd annual archery competition. Each park with host an event. Prizes will be given out at both events for the top 3 youth and top 3 adult competitors. For people who participate in both events, top 3 overall adult and youth awards will be given out as well. Come experience turn of the century farm and homemaking demonstrations at Fort Ransoms' annual Sodbuster Days. Enjoy live old-time music. Food and beverages will be available for purchase during the event. Come celebrate the Christmas spirit at Fort Ransom State Park's 5th Christmas in July! Decorate your campsite for Christmas. There will also be a parade around the campgrounds to see Santa and get some treats! Come for all the exciting entertainment at Fort Ransom State Park's 5th Christmas in July!